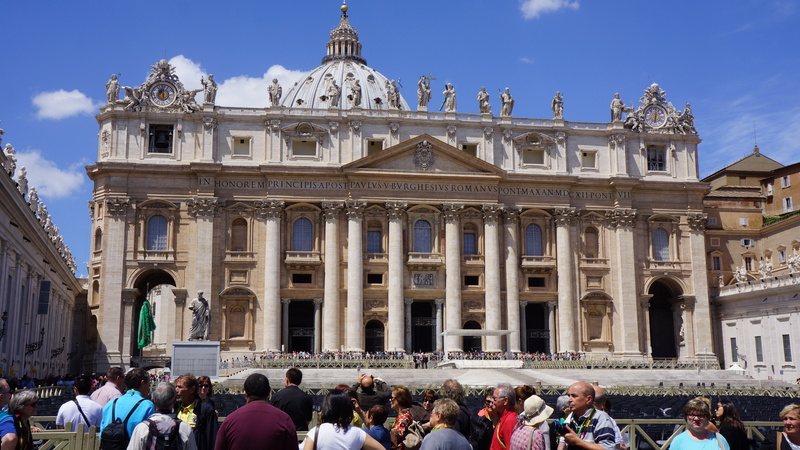 Just like most tourists that visit Roma, we really wanted to go to Vatican City and see the Sistine Chapel and St Peter’s Basilica. 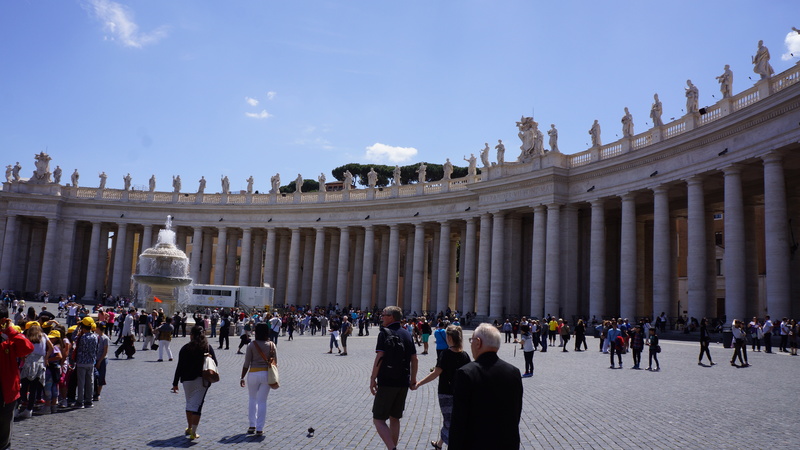 Since we don’t love crowds we decided to take the Pristine Sistine tour with Walks of Italy. 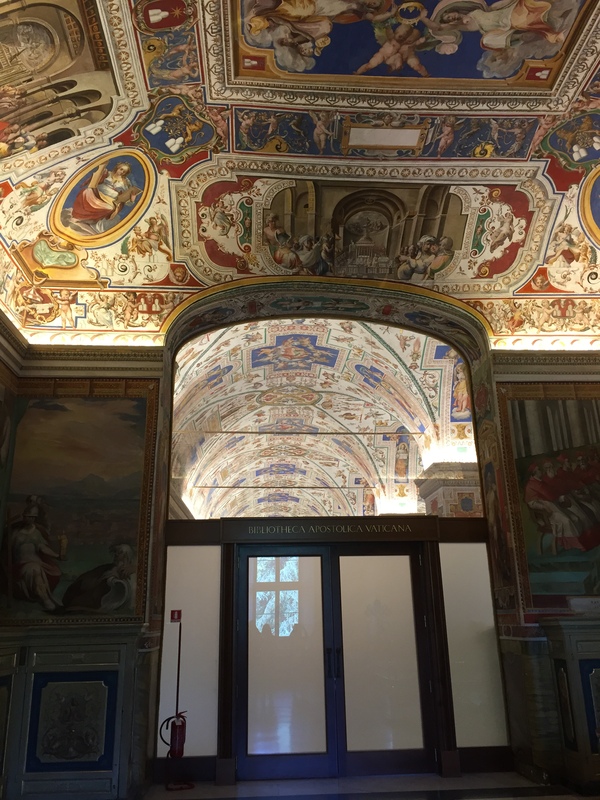 This tour allows you to enter the Sistine Chapel and see the Raphael rooms an hour before it opens to the public. We met our tour group at the designated spot near Vatican City. There was a large group of people waiting so it was easy to find. We were then divided in to small groups of 12 or so and our guide, Katja, gave us headsets to wear for the tour. At first I wasn’t thrilled about the headsets, but as we made our way through the tour I realized just how nice it was to hear our guide, Katja, without having to be right next to her. 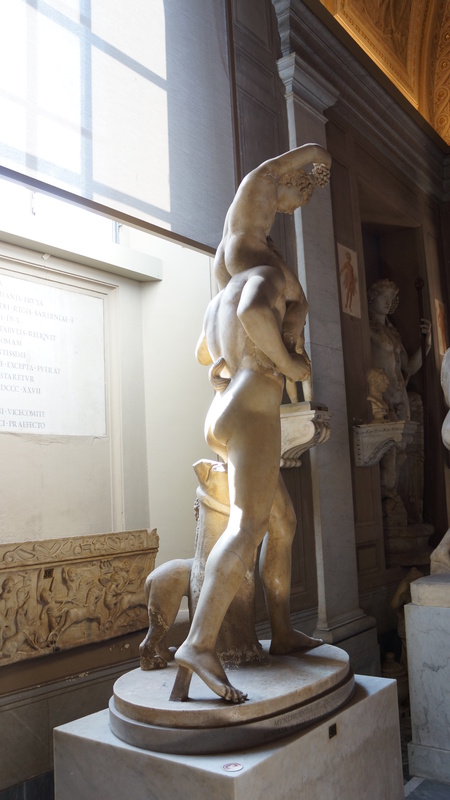 Once we were inside and through security, we quickly walked through the galleries straight to the Raphael rooms. 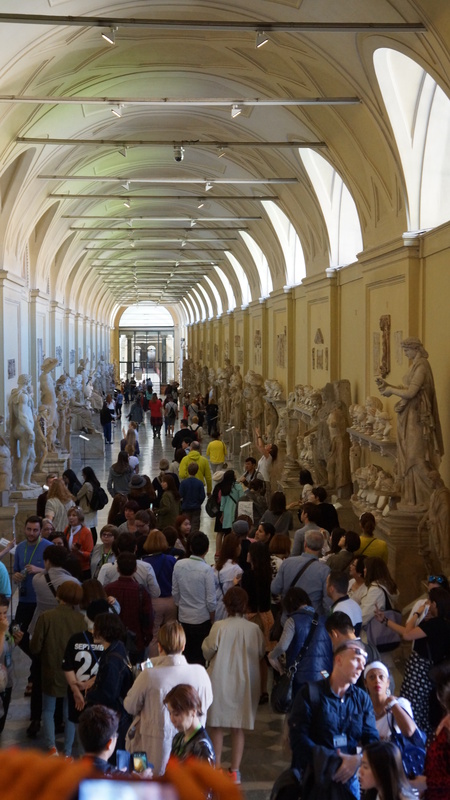 It was hard to keep moving instead of stopping to look at all the beautiful art, but we were assured that we would return and it was best to get to the Raphael rooms and the Sistine Chapel as quickly as possible, to beat the crowd. Of course, she was right. We were the only people in all of the rooms. 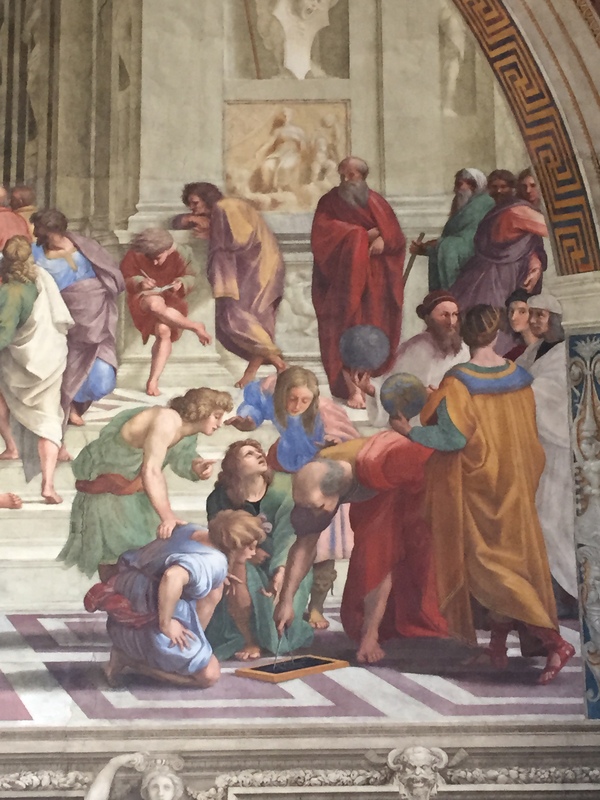 The Raphael rooms are a suite of rooms that Pope Julius II commissioned Raphael to paint. Unfortunately, both died before the suites were complete but, lucky for us, their successors were sure to finish the suite. The rooms are absolutely gorgeous as well as very important, especially in the art world. 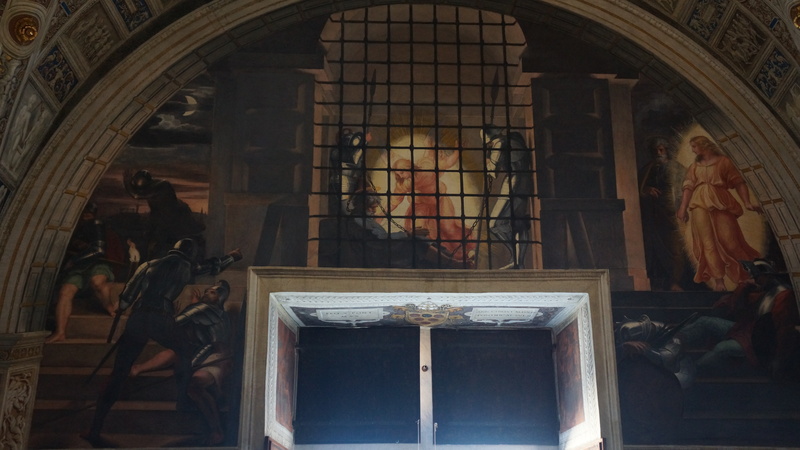 Some of the frescos (paintings painted directly on wet plaster) in the rooms were the first paintings to show perspective, as well as light and dark contrast. The angel providing light is the first example of light and dark contrasting using shadows. My favorite fresco of the whole tour. 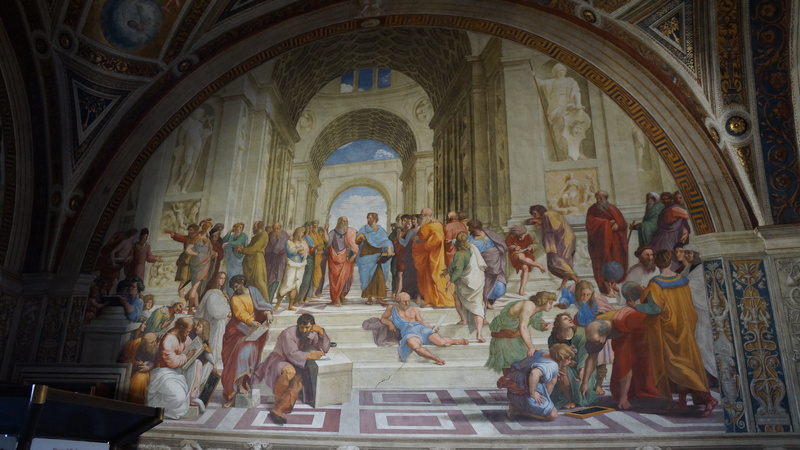 There are many portraits, including Michelangelo in the front left, sitting alone, Ptolemy, the mathematician, in the front right and a self portrait of Raphael, behind Ptolemy. 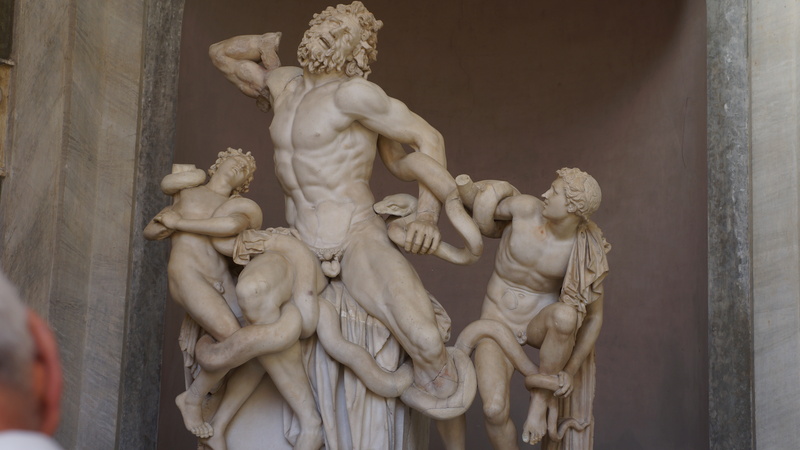 Ptolemy is bending over, teaching, and Raphael is the second from the right, wearing the black hat. After we walked through the Raphael rooms we headed toward the Sistine Chapel. There were only about 50 people there and it was so nice and quiet. There are guards in every corner, making sure you aren’t talking (respect for the room) and also to make sure you aren’t taking photos. A Japanese company paid for the restoration of the room, so they own the copyright of the paintings. You aren’t allowed to take photos. Which is a shame, because it’s so beautiful. It’s seems even more amazing that Michelangelo was able to paint that ceiling after getting a neck ache just looking at it. It’s not surprising that he refused to “paint the roof of a barn” when the Pope first attempted to commission him for the job. Luckily for the world, he did it anyway. After admiring the Sistine Chapel we headed back to the museum to check out the gallery we rushed through on our way to the Raphael rooms. 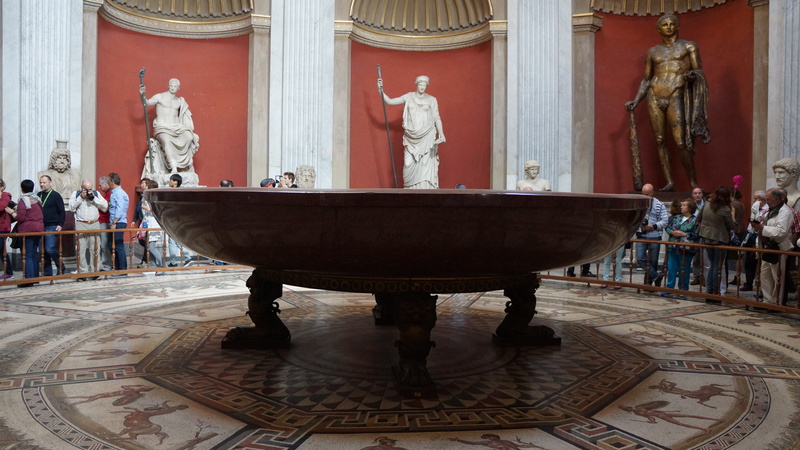 We saw some beautiful frescos, statues, and gifts to the Pope from famous people. 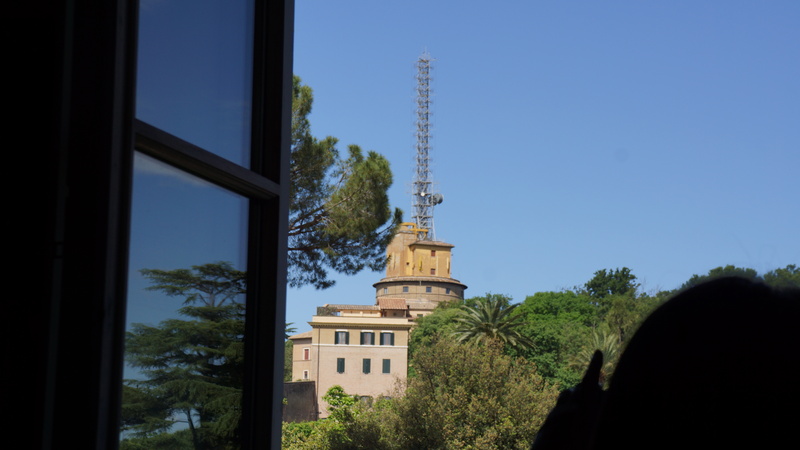 We saw where the former Pope Benedict is currently living. Then we headed back towards the Raphael rooms and the Sistine Chapel. This time, it was during regular hours and you could barely move! If I wasn’t already so happy that I booked this tour, I would have been now. What a difference! You could barely move. It was really hard to take in and appreciate the beauty of these rooms when it was packed so full of people. There were barely any people the first time through. 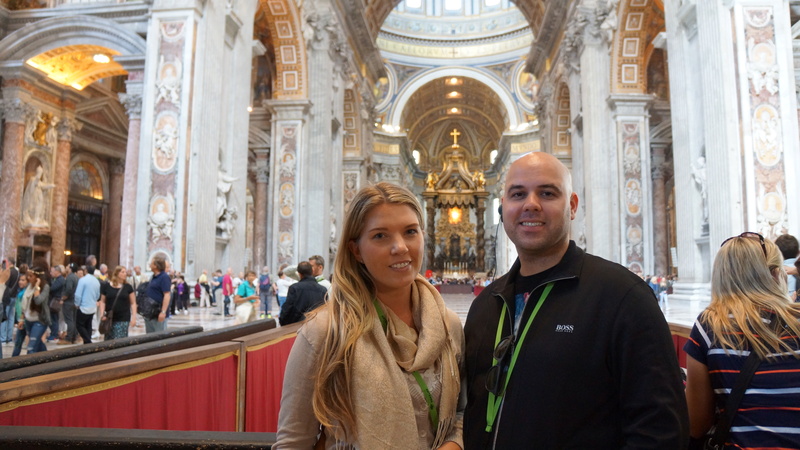 Next we headed to St Peter’s Basilica. It’s impossible to describe the beauty, and the huge size, of the basilica. 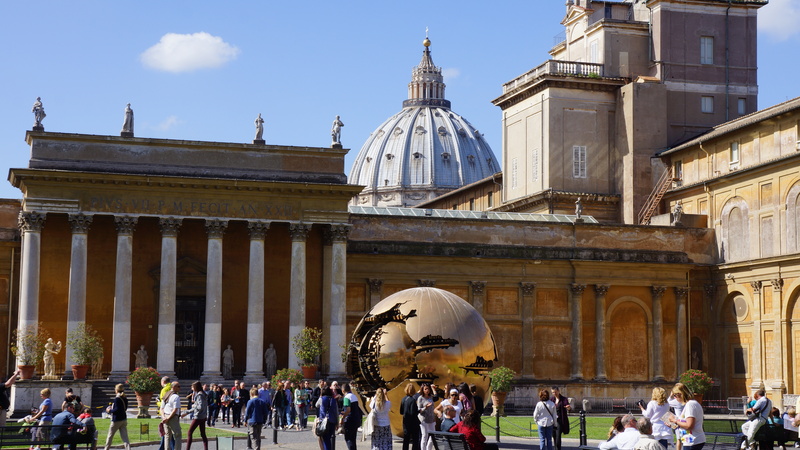 The gold orb is the exact same size of the one on top of the basilica. See the letters written along the base of the dome? Those are over six feet tall! One of the very first thing you see before you enter is the Holy Door. Usually opened only on Jubilee year, Pope Francis declared this year an “Extraordinary Jubilee of Mercy Year” and the doors will be opened December 8th, even though it is not a traditional Jubilee year. Pope Francis is such a contemporary and awesome Pope (yes, I’m Catholic and clearly a fan of Pope Francis). The Holy Door. It’s cemented shut and only opened during the Jubilee year. 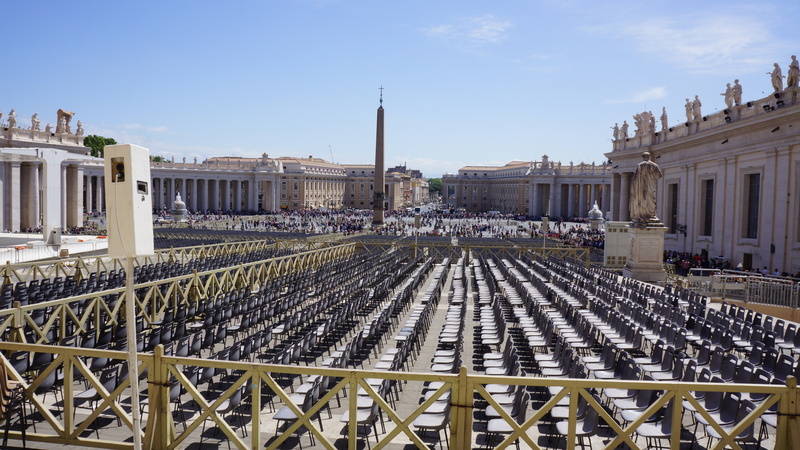 The basilica was being set up for the Pentecost mass the following day. 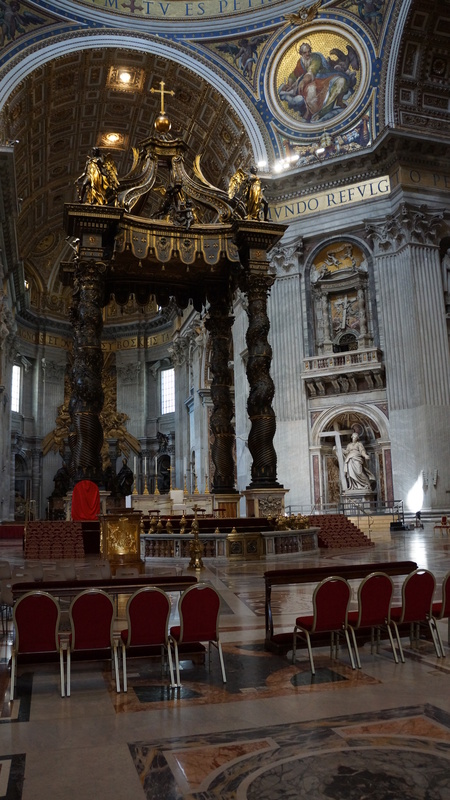 It was really cool to see it being set up and then watch it the next day on the Vatican channel. 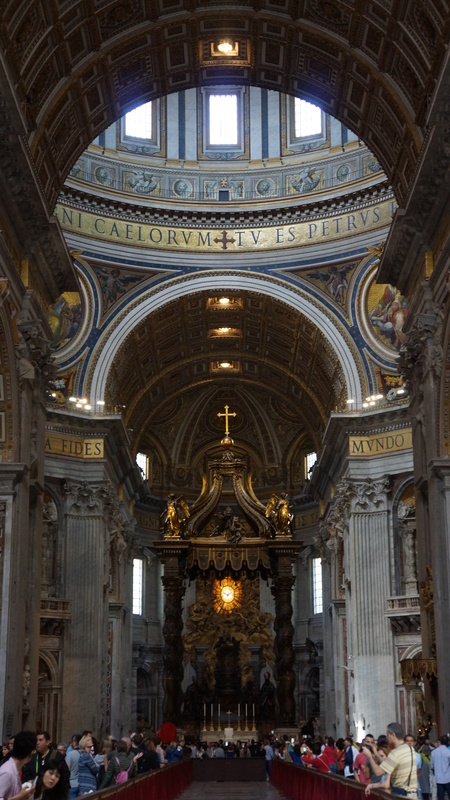 Only the Pope delivers mass from the center of the basilica. The white chair is his chair. 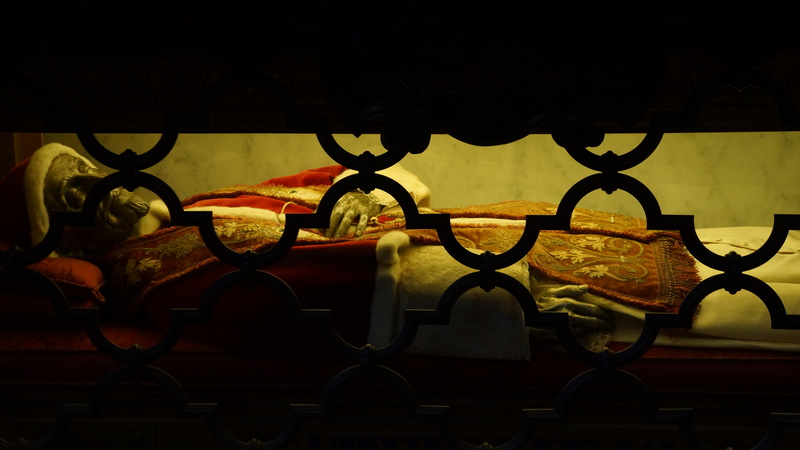 There are a few bodies of former Popes that are in glass coffins, on display in the basilica. I believe it has something to do with the beatification and canonization process. Katja was so full of knowledge that I couldn’t possibly remember a fraction of what she told us. At the end of our tour we headed outside to enjoy the beautiful view and so Katja could answer any other questions we might have. 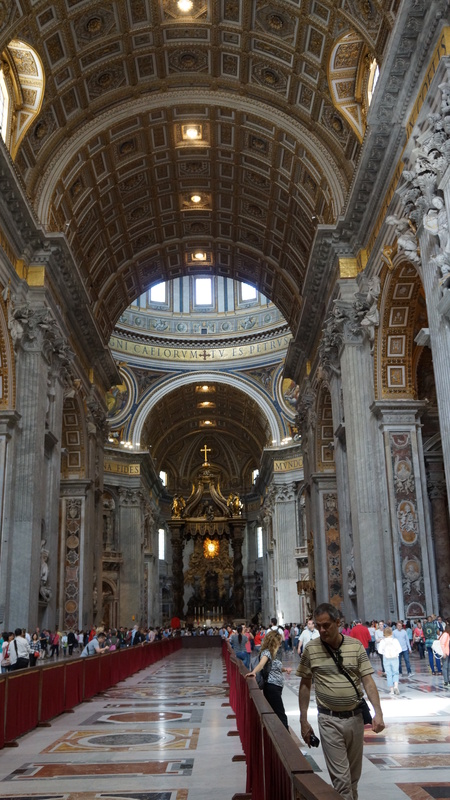 After turning in our headsets we were free to go back inside St Peter’s Basilica or head to the line to go to the top of the dome. We passed on that, since we’re claustrophobic, afraid of heights, and the final climb involves a spiral staircase with a rope in the middle! 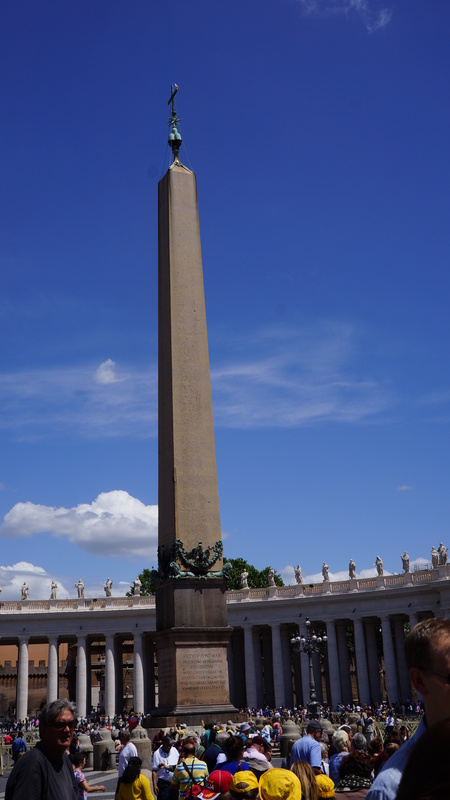 Instead, we said ciao to Katja, headed back inside, and went downstairs to the tombs of the Popes. It was an amazing grotto that had so many tombs and was absolutely gorgeous and surreal. Respectfully, photography is not allowed. After looking at every tomb, we headed back upstairs and outside. Vatican City was greater than I could have imagined. The art was so beautiful and St Peter’s basilica is so grand and spectacular. I highly recommend taking a tour, as there is so much to see and learn while you’re there. After walking back to the Sistine Chapel during public hours, I would never go back without a before-hours tour. 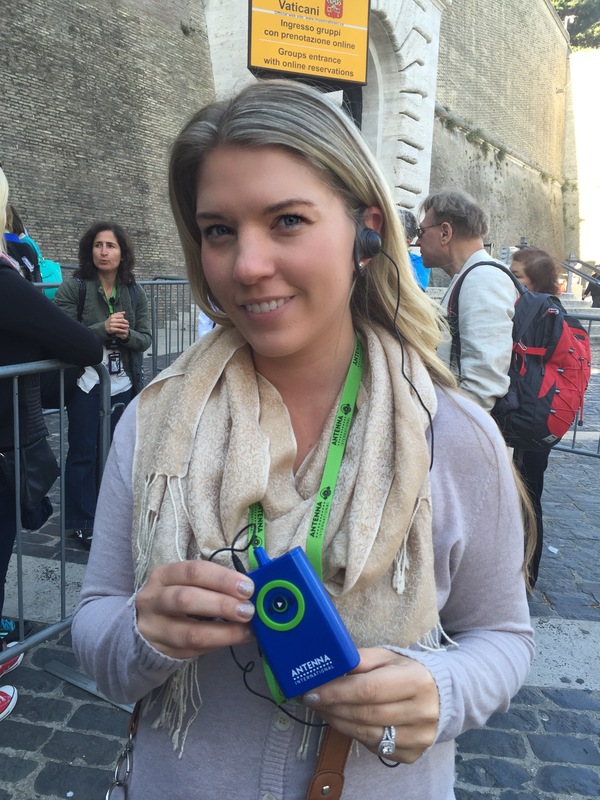 Our Walks of Italy guide, Katja, was so knowledgeable and passionate about Vatican City, as well as Roma. She was also very engaging and entertaining, which made the tour fun. The Husband and I actually enjoyed the whole tour and we aren’t usually the tour type. We will definitely use Walks of Italy when we return to Italy some day. Walks of Italy paid for my ticket, but not my opinion. These thoughts are all my own (and some of the Husband’s).